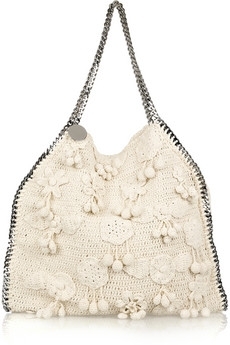 I spotted this incredible Stella McCartney bag on line. And since I didn't have $866.00 cash laying around to dish out (clearance price) I decided to DIY it. I cut off the original handles and took out the draw string. Then I found a box the purse would snugly fit over and started pinning the chain to the sides. I would pin a few inches then sew with yarn. I went up over and down keeping the chain all one length. Then I reversed and sewed the other side of the chain. I truly love it and the only thing I would change is buying some vinyl lacing instead of yard. I might yet do that. Well, I probably won't but should. Soooooo, what do you think? Love it !!! The chain you found worked great . It turned out great...and now I'll forever be looking at designer things with an eye for DIY too. wow...such a cute bag ...Tammy! Great inspiration and refashion. I love it! Now the bag looks so adorable now! You are amazing, Tammy...this is fabulous and you are so talented! What an inspiration to those of us who do not have eight or nine hundred dollars in our disposal for a bag!! Great work! Oh, well done, you! I'm now tempted to break out my crochet hook and have a go at making a bag for summer. I LOVE THIS!!! what a fabulous idea and you make it look so simple! You did an amazing job on the DIY purse! Love it! Great job Tammy! So creative!! i am very impressed! you saved yourself a ton of money, and it looks almost identical!! knock knock....is anybody home? Just checking if everything is ok. I was wondering about you too, hope everything is well! I'm seriously impressed!! You did an amazing job and I love that you had the determination to recreate something you love. I actually came by to make the same comment as the two above...hope you're just on a little break and that everything's OK. We miss you in the blog world!